Having manoeuvred their way through, and successfully changed the face of, UK hip hop throughout the early years of the last decade, Foreign Beggars more recent output has been a genre-defying combination of their former musical machinations and speaker-busting, dancefloor rumbling dance music produced by some of the finest artists around. 2009s Contact, taken from the Beggars third artist album and now with over 3,000,000 views on YouTube, saw them combine furious London-fuelled rapping with Noisias crunching electro backbone and was the start of what has become Foreign Beggars great new obsession; fusing traditional UK hip hop with dance music. What Foreign Beggars have delivered over the last four years is a succession of incredible collaborations and remixes. Each release seems to bring greater and greater success and critical acclaim, from the incredible Beggatron Remixed album which featured reworkings and originally produced Foreign Beggars tracks from Plastician, Bar9, DJ Troubl, Diverse Concepts, Chasing Shadows, Noisia and more, to the Beatport chart topping Scatta produced by Skrillex, the casual gun fingers anthem that is Lines In Wax produced by Flux Pavilion and the recent team up with Vato Gonzalez Badman Riddim out on Ministry Of Sound in June. Never Say Die has been home to two such incredible remixes, having released SkisMs fierce version of Get A Bit More and Excisions take on No Holds Barred in 2010. 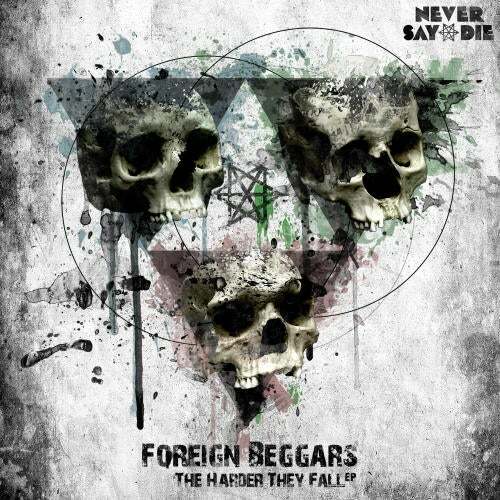 This year sees them commit to their relationship with the Beggars fully by releasing The Harder They Fall EP, the first in a three part series of EPs produced by some of the hottest artists on the planet. Featuring six brand new Foreign Beggars tracks produced by Alix Perez, Mensah, Lazer Sword, Medison, Ruckspin & Durrty Goodz, Black Sun Empire and the aforementioned Skrillex, their debut Never Say Die EP hits the 140bpm tempo straight between the eyes, offering a range of styles and flavours that could loosely be described as dubstep, without the superfluous connotations that the mere name of the genre now evokes.